Paris is home to our new, purpose-built, 300-bed hostel. Our St Christopher's base is just two stops on the Metro from Montmartre and Gare du Nord. This is one of the most modern backpackers' hostel in Paris and we've kitted it out with the best tours, packages and facilities for the best, most clued-up backpackers in Paris. To jump the line and save time, you can even express check in online (24h the latest prior arrival) ! All guests receive a 25% discount on food at the on-site restaurants, plus great discount deals on drinks! This is the benchmark for a new generation of hostels - so when you stay with us, be prepared for the time of your life. There's going to be live music and great parties in our Belushi's Bar. We have free Wi-Fi and fantastic views as seen in the visually tantalising film 'Amelie'. There's also something a little special for us ladies because we've brought our successful female-only floor to Paris, called 'The Oasis'. Here you can escape the boys, enjoy a few extra creature comforts and hit the streets of Paris looking human again. Meet travellers by trying out our daily new backpackers' meal every night at 7pm for only ï¿½7; book on arrival or from the bar anytime before 6pm. Party addicts watch this space! You can join the locals and backpackers in our Belushi's Party Bar. The main weekly events include the Wednesday Night Pub Quiz, Thursday Night Live Music and Saturday Club Party. There's happy hour every day, with pints from ï¿½4.50 and 2 4 1 offers on Demory Bottled beers, vodka and gin and a selection of ï¿½1 shots with your room key. Please note that we do provide linen, but remember to bring your own towel. Breakfast is free of charge. There are large storage lockers in the rooms; just bring your own padlock for security. The hostel also has luggage storage so you can go explore beautiful Paris. ***Please note that we do not allow under-18s to stay in this hostel. 1. Take the RER B toward Saint Remy les Chevreuses. 2. Get off at Gare du Nord. 3. Take metro line 5 toward Bobigny-Pablo-Picasso. 4. Get off at Laumiere station. 5. Take Exit 1 and walk straight on for 300-metres, until you come to a crossroads. 6. Turn left and walk for 3-minutes until you cross a bridge over the canal. 7. Here you will find St Christopher's Inn Paris and Belushi's bar. 1. Take the Orlyval train shuttle. 2. Connect with RER B and take this toward Paris. 1. Take the Airport shuttle to Porte Maillot. 2. This should cost approximately 15 euros and take 45 minutes. 3. At Porte Maillot take metro line 1 to Palais Royal. 4. Change here and take metro line 7 toward La Courneuve. 5. Get off at Crime. 6. Take the rue Mathis exit. 7. Cross the large avenue and follow the rue de Crime. 8. St Christophers Inn Paris and Belushis bar is 200-meters away on your right, just before the canal bridge. 1. Take metro line 5 toward Bobigny-Pablo-Picasso. 2. Get off at Laumiere station. 3. Take Exit 1 and walk straight on for 300-metres, until you come to a crossroads. 4. Turn left and walk for 3-minutes until you cross a bridge over the canal. 5. Here you will find St Christopher's Inn Paris and Belushi's bar. 1. Take metro line 7 toward La Courneuve. 2. Get off at Crime. 3. Follow rue de Crime toward the canal for 150-meters. 4. Here you will find St Christopher's Inn Paris and Belushi's bar. 1. Take metro line 1 toward La Defense. 2. Get off at Bastille station. 3. Take line 5 toward Bobigny-Pablo-Picasso. 1. Take metro line 4 toward Porte de Clignancourt. 2. Get off at Gare de lEst. 3. Take metro line 7 toward La Courneuve. 4. Get off at Crimee. 5. Follow rue de Crimee toward the canal for 150-meters. 6. 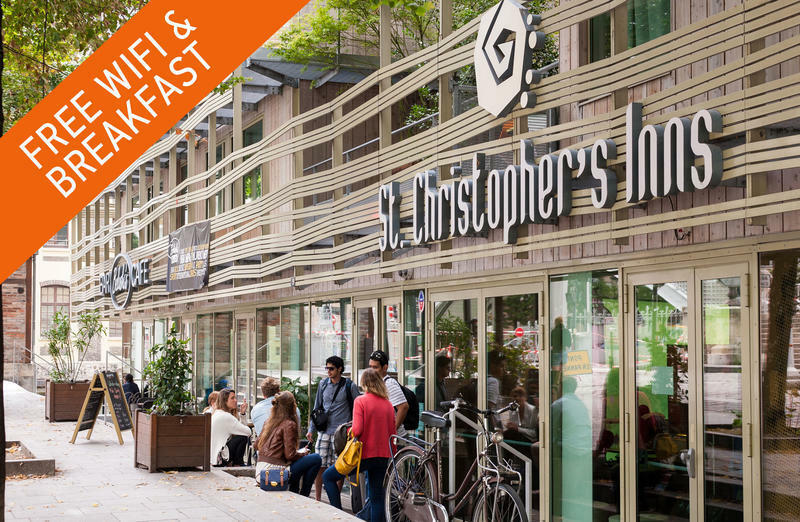 Here you will find St Christopher's Inn Paris and Belushi's bar.